Schnitzel-like dish made from the most popular cut in Brasilia – Picanha! 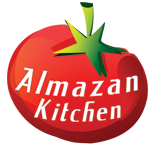 It was grilled on special AlmazanKitchen handmade round grill under the awesomeness and simplest marinade you can find for the meat – oil, S&P + chili and onion! And it is not all! We also served our Picanha on the huge baked potato with melted mozzarella and kajmak! Deeeeeelicious! Come, join us by the fire and enjoy! Fill the pot with water, make the deep incise in the huge potato, toss it into the pot and add some salt. Place the pot into the coals, cook for a while until ready. Slice the 500g of top sirloin cap into thin slices. Grease each piece with oil and S&P, add 1 tsp. of rice vinegar. Slice the green chili, add to the meat plate. Slice the onion, divide into rings and add to the meat plate. Unpeel and smash 3-4 garlic cloves, chop and add to the meat plate. Preheat the grill, grease with oil. Grill the meat until doneness you want. Do not forget to flip halfway and leave it to rest after the grilling. Take out the potato from the pot, cut in half, place both halves on the grill. Place some mozzarella on the potato halves. Add some oil. Let it melt. Chop handful of fresh ruccola, add some to the potato with mozzarella. Add the kajmak to the potato with mozzarella and ruccola.